Have you ever used this stuff before? I'm using horsehair braid for the first time and I'm enamored. I've been working on a very special project: my very first draped design! Don't get too excited, it's a very simple silhouette - no cowls or shirring or pleats. But I draped the thing myself! It's a 50s-style dress (shocker, eh?) with a boatneck and a very full skirt. I'm making it out of the most beautiful textured cotton in what must be Schiaparelli Pink (though it looks a bit Fanta Orange in these pictures!). 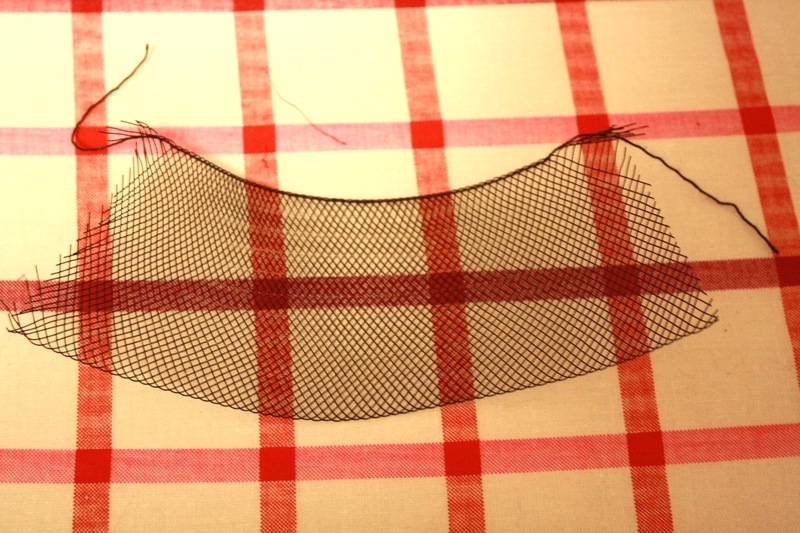 I was researching hem methods, and I was thinking about doing a faced hem for a little more body at the hemline. And then I came across the section on horsehair braid in Professional Sewing Techniques for Designers, which is absolutely my new favorite sewing book. I was intrigued! Horsehair braid acts as both a facing and a hem stabilizer. It's used to add structure to hemlines: think of a sculpted mermaid skirt or a full ballgown. It added the perfect swingy fullness to my knee-length circle skirt. First off, what is it? Horsehair braid used to actually be made of horse's hair, but now it's made of nylon or polyester. You can buy it in various widths. 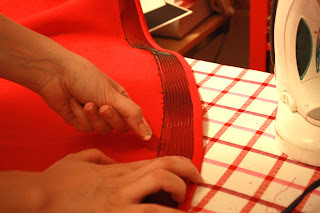 A wider width will give you more body to your hem, and a narrower one will be more subtle. I didn't go subtle! I went with a 2" width. (They had from super tiny up to 3" wide at Steinlauf & Stoller, and it came in both black and white). A quick Google search turned up lots of online vendors for this stuff, in case you can't find it locally. The braid has a string at the top. See the loopy bit up there? This is used to pull the braid tight at the top to shape it, resulting in a curve at the bottom. 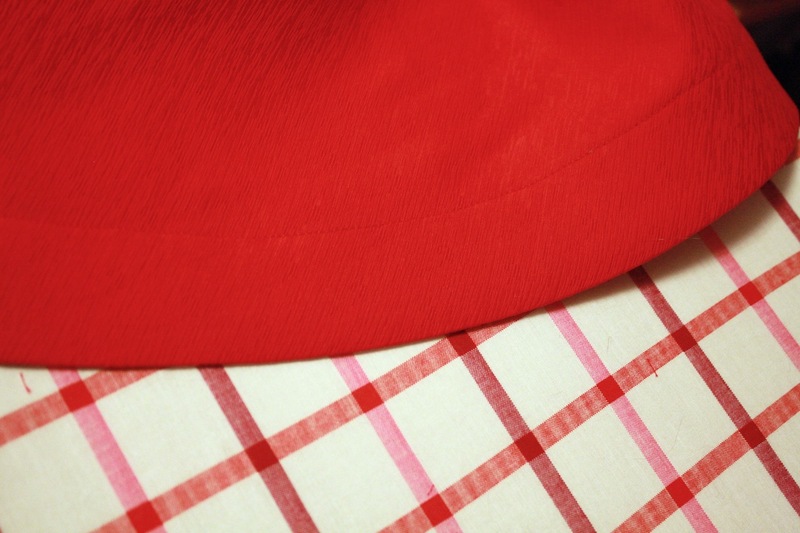 Perfect for a curved hem like a circle skirt! There are little loops throughout the braid so that you can pull them up incrementally as you go, not just on the ends. Isn't that genius? *Update: I just learned that the narrower widths of horsehair don't have this string at the top. That's because they're easier to shape on their own. So don't sweat it if yours doesn't have this! 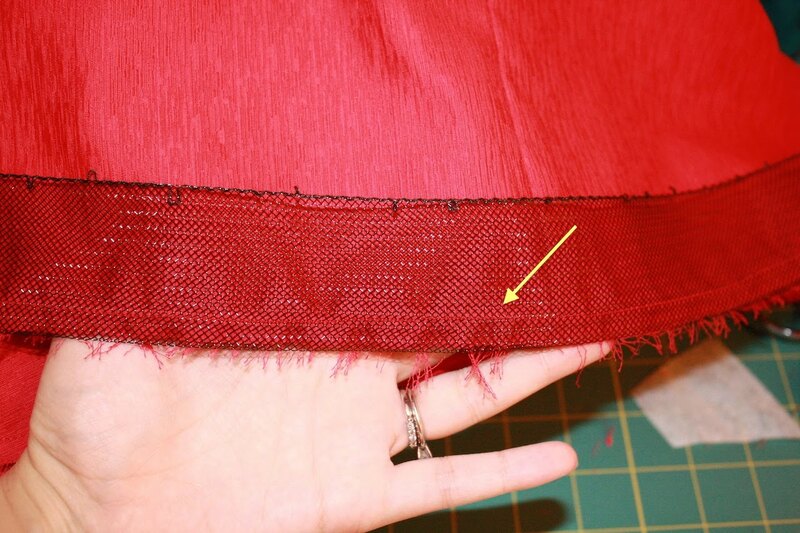 Before you start your project, you need to decide if you're going to either: 1) underline for an invisible hem - the horsehair braid gets catch-stitched to the underlining in this method or 2) top stitch your hem. For formal wear, you'll obviously want to underline. Since I'm making a day dress, I decided to top stitch for ease and a more casual look. So here's how to apply your horsehair braid. 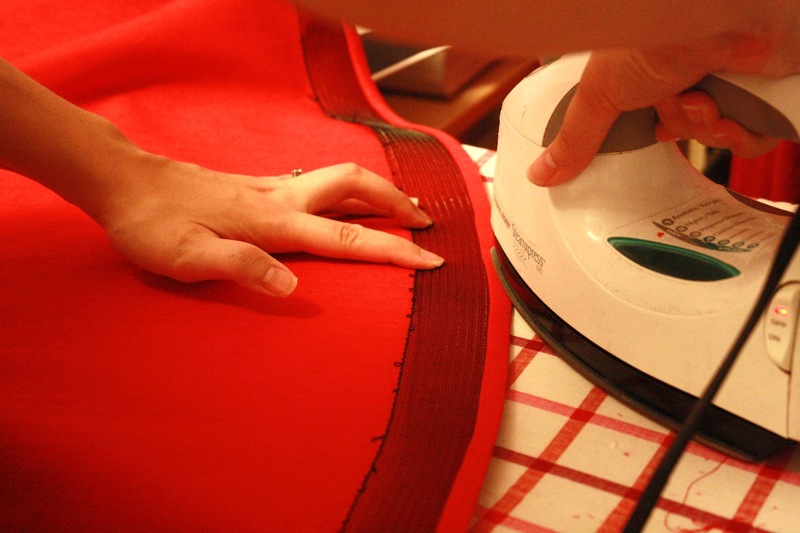 Start with your dress at the desired length plus 1/2". 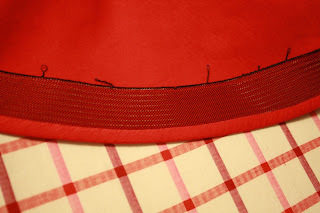 If your fabric is thicker, you might want to add a smidge extra for turn of cloth. 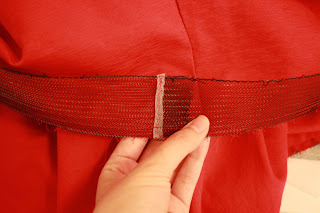 First, you're going stitch the braid to the right side of your dress, lining up the bottom of the horsehair braid and the raw edge of the bottom of the dress. I wouldn't necessarily recommend pinning it first: this is because you don't want to pull the braid as you go, you want it to apply flat. 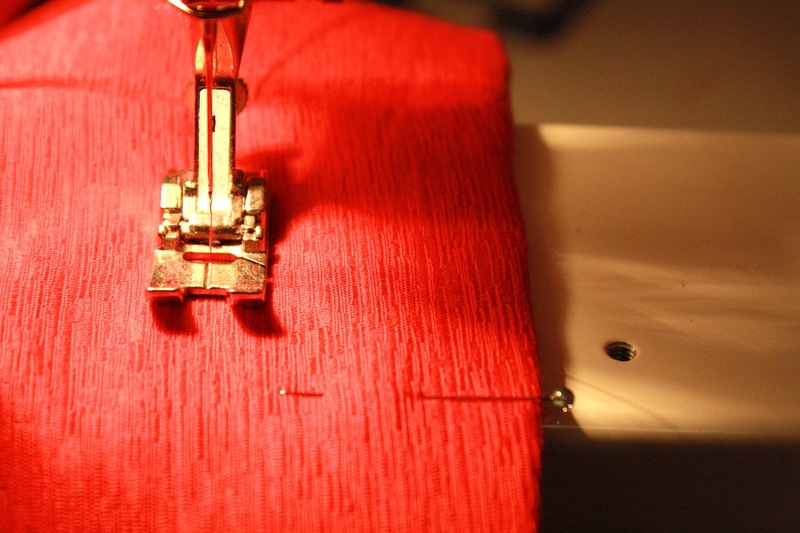 If you pull it as you're applying it, your hem will look twisted. Just keep feeding it and lining up the braid and the dress's raw edge as you stitch. My 1/4" stitching line is pointed out with that handy yellow arrow. Keep in mind that this is the outside of the dress. 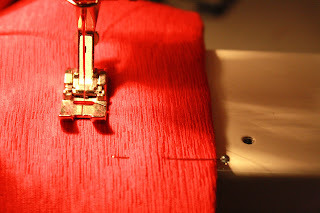 Now flip the braid to the inside and press the hem. 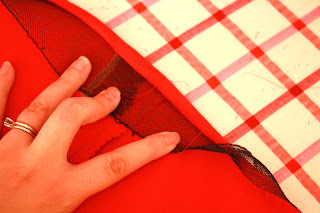 Avoid ironing the braid itself, just press the hem. If your hem is curved, you'll need to pull the loops of string incrementally so that your braid will curve up. You're shaping your hem - isn't it exciting?! 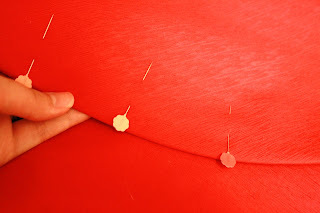 Pin the hem as you go. I'm pinning on the outside of the dress since I'm going to top stitch it and that's the side that will be facing up. Now take it to your machine and top stitch. Find the right hem width that will catch the horsehair braid near its top. Use a slightly longer stitch width than usual for prettier stitches. I'm using 3 mm here, but next time I'll probably go with 3.5 mm. *Update: To avoid the fabric twisting as you top stitch, it helps to feed the fabric to the left of your presser foot through as you go with your left hand. If you notice the fabric pulling or twisting, stop stitching and raise the presser foot (with your needle down), and smooth out the fabric around the presser foot to release any tension. Press your finished hem. Pretty on the outside! And it will be super awesome once I cut those loops off! I'll be photographing the dress this weekend and I can't wait to show you how rad this skirt looks in action. In the meantime, I hope this tutorial was helpful! Let me know if you have any questions. LOVE it! Thanks for such a great tutorial. I've been thinking about applying horsehair to some of my projects, so I'll be bookmarking this for when I do. This looks like a great technique, thank you for sharing! I will be trying this sometime soon I think, as I also love full skirts. I love your blog- I've been lurking here for ages! I've often wondered, how does applying horsehair affect the laundering of the item? Also, I'm in the UK- we have something similar called "crin"- I'm not sure it has those nifty loops though. Does anyone know if its the same? Golly, I don't know anything about sewing but this is just fascinating. At the moment I'm still working on stitching in a straight line, but I can't wait until one day I can do something like this! That's a great tutorial,thanks. I had heard of horsehair braid but always presumed it was something to do with 'serious' tailoring never realised it was like this - perfect for shaped hems. I can see this coming in handy for all sorts of projects. Is your dress also a shorter length? Most references of horsehair braid are for floor-length skirts and not having used it, I'm not sure how subtle or not its effect is? While I don't want my hem to flop, I don't want an overly perky skirt that looks like like its had a caffeine overdose! My dress pattern (9265) is on my blog page. I can't wait to see your photos, the fabric looks lovely. PS. 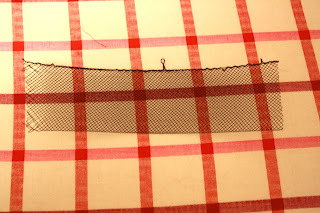 Kaye, "crin" is the same thing, its also known as "Crinoline tape", I learned that in the most random way, translating a pattern from Japanese! I'd only ever heard of it has horsehair braid before even in the UK. I have used it before; in a Snow White costume I made for one of my daughters several years ago. It makes a full skirt really stand out. I had forgotten about it. Thanks for the reminder. I imagine this is the same stuff that's used for big ruffles and serious stand-up collars and peplums and such. Awesome! Now I know what I can do to my fishtail skirt to make it look the way I want to. This is such a nifty notion and I never knew about it. Excellent! I look forward to trying this, and thank you *so much* to alerting all us other nerds about this technique! You rock! This is fantastic--I had read about horsehair braid but never seen it in person or in action. Thanks for the very clear pictures and instructions! Horsehair braid is like magic, right? I love that something so simple can add so much glamour in a no fuss manner. Your tip about facing with bias tape to cover up the scratchy surface is genius, because it's more practical than putting an entire lining in. Think of the effect horsehair braid could add to a swing coat.. I cannot wait to see the fruits of your labor.. 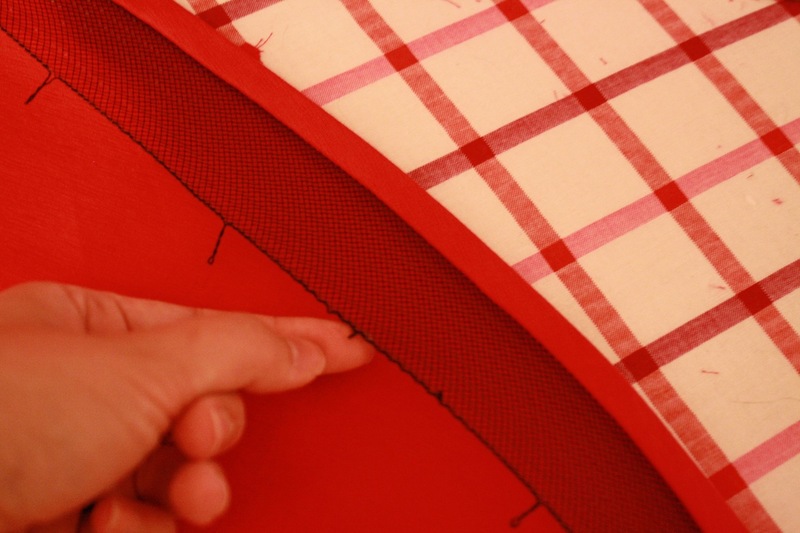 If you love this technique, be sure to look at padded hems too. They're definitely more of an application for a floor length dress, but it adds fullness and just enough weight to make a formal look really stunning. And fun to apply engineering-wise. What a great tutorial. I have used such a braid before but mine did not have the gathering loops! (it was for a costume) great photos, can't wait to see the finished product. Ladies in dresses and skirts again...what a great idea, reclaim our femme! Thank you for another wonderful tutorial. Not sure when I'll ever have an occasion for horsehair braid, but you have certainly made me want that book! And I am eager to see your dress. Hi guys, glad you like it! Re: laundering. I don't know what the professional recommendation is, but I personally wouldn't dream of machine washing a dress with this in it. You know how underwire bras get all twisted in the machine? Well, this stuff is more pliable, and I used six yards of it in my dress, so it would turn into a mess! Better to hand wash or dry clean. Molly, I'm glad my timing was good! Love it when that happens! Yes, my skirt is knee-length. A good way to see how much volume you'll get is to pin the braid to your hem as a test run. Try a couple different widths of braid. You might want to try 1" wide or less for subtle shaping. Gertie I want to use horsehair braid for the bottom of a ballroom dress but I want very accenuated ruffles. I also want to use a contrast colour so I want it to show. Is it best to use a narrow braid and what is the best way to apply it. There will be absolutely loads of meterage and I have both a serger and sewing machine. GORGEOUS!!!!!! Wow--I'm totally in awe. Thanks for another hemming option. Wow! This is fantastic! If I ever finish the skirt that's been sitting on my sewing table for a month, I definitely want to try a project that calls for this next. Thanks for the info! I'm so excited about your first draped garment. Can't wait to see it. This was a great tute. I am seriously thinking about using horsehair braid in all my light summer dresses with full skirts because I love the fullness but sometimes it's just too hot to wear the fluffer underneath. I think a horsehair braid hem will keep my skirt fluffed out for maximum breeziness. great tip! and btw- if you are ever doing a full lining to the skirt anyway, cut your lining to the exact hem length and stitch it right-sides-together into the same quarter-inch seam with your skirt fashion fabric. So- closest to your feed-dogs is the wrong side of your fashion fabric, then lining, then horsehair braid on top. When you turn it all right side out, the horsehair is trapped upright between the skirt and lining- no topstitching required! It's a bit of a brain tangler, but gorgeous and easy- a one-seam hem for a lined and stabilized hem! I'm absolutely in love and can't wait to try this on my own garments! Great tips! Thank you for sharing. I think I need that book too! "I think a horsehair braid hem will keep my skirt fluffed out for maximum breeziness." I can not wait to see this dress. Your description of it made me swoon. I started a new job recently and don't have time for creative sewing anymore. So jealous! Cool stuff! Can't wait to see the finished project. Well SHUT UP! I used to work at a fabric store back in the day, we carried horse hair but NO ONE ever bought any... I always wondered the proper way to use it. 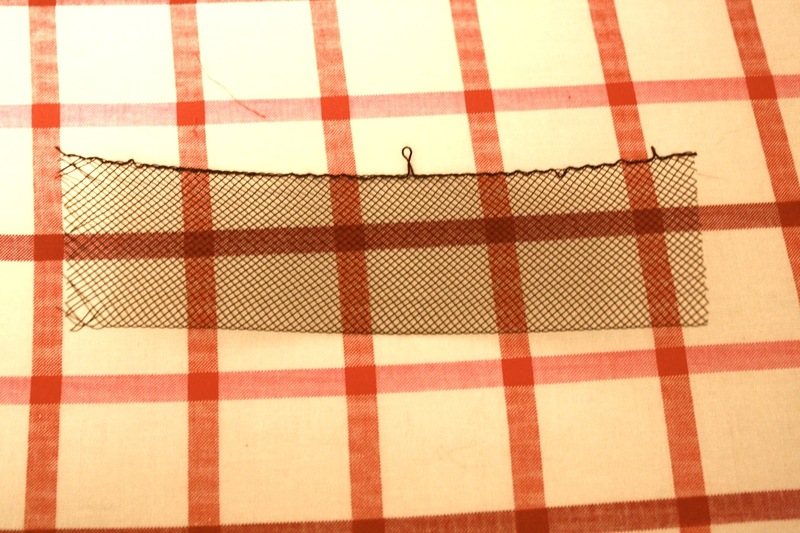 AND after sewing my first 1947 repro pattern, I wished I had it for the hem of the skirt. This was super helpful! Thank you very much! I was always afraid of horsehair braid, but now I feel empowered and ready to go! I must admit when I first read the title of your post, I immediately thought of horse tail hairs, braided. It was a relief to learn that it is made from nylon now. Thanks for the tutorial. You made me think I could do this...that's the sign of a good teacher! Thanks a ton. Another awesome tutorial. Thank you so much! You are just the coolest! Thanks for the tip Gertie as well as the great tute, feel reassured to hear its worked on a similar skirt too. In fact you've got me thinking now of all sorts of projects to use it for! That is the most awesome and wonderful thing in the history of awesome and wonderful things! Look at how awesome and wonderful your hem looks! You're blowing my mind, Gertie! Thank you so much for the tutorial. My grandmother had some couture clothing and it's so interesting to see the why's of a lot of the structure engineered into such garments. If you don't mind my asking, how are you going to ensure that the cord at the top doesn't pull out after you cut off the loops? Enjay, I don't think it matters if the cord comes out since the horsehair is topstitched in place. I wouldn't cut out the loops if I'd catch stitched it to an underlining, though. Does that make sense? I work in costumes for theatre and we use horsehair ALL the time- it's one of my favorite toys! I've been dying to make a hat out of it for ages. Can't wait to see the finished dress! I love horsehair braid - and wouldn't it be great to see a sample from the past century - it must have been made from actual horsehair? I just used it on a dress I made and wrote a bit about it. Alright already. Thank you. I adore you. You're swell! You're smart, funny and beautiful. Really. I am just starting to embark upon the journey of sewing clothing. I've sewed costumes, the obligatory bag, and too many pillows, and am finally confidant enough to start sewing garments, yes, really. Sorry to ramble, but every time I search for a sewing, term, review, opinion, technique, guess who comes up? That's right, you. Really. So much so, that you might say that my dear husband may actually be a bit weary of hearing about Gertie from Brooklyn already. So, thank you Gertie from Brooklyn, you always do such a wonderful job and I appreciate your sharing your projects, musings, and knowledge. Laundering horsehair braid isn't a problem. IF you machine was on your delicate/handwash cycle. Also, it's the clothing fabric that really determines the wash method. I've never had a problem washing my horeshair braided dress in the washer and hanging it to dry. thank you so much for this practical hemming solution. your method is sooo much easier than what I was finding in other sources. I knew that horsehair braid was the way to go, but this dress is "for real life" and not Musical Theatre Costuming. Gertie - I'm in the process of making my daughter's wedding dress, which calls for 3" horsehair braid. I've never used it before and am very excited to see what the outcome will be. Thanks for sharing your tips and photos. They really helped me to visualize what I will need to do. wow this tutorial is amazing, this seems like a magic tool, horsehair who knew? I love your blog! I'm just starting to sew and it seems that every question that I have is answered by your blog! A big, big thank you! Great tutorial, very easy to follow. Thank-you so much for taking the time to create it. SOLD! Says the girl from the south. I was just reading this in your book before I left home to come post on my blog. I am doubly sold and can't wait to purchase and use this, Gertie. As always, thanks for the tips. Oh, and get this. When I purchased your book I read it cover-to-cover. Well, this morning I felt like some Gertie time and pulled it out again. Actually wanted to read up on the Portrait blouse. I saw so much stuff in there that I have been wanting to learn, don't know why I didn't recall it there but it looks as if I have a way top sewing reference in my own home. No need to run to the 'net as much as I thought I was going to have. The only thing funner than my Gertie book is actually sewing. Do you think this would work on tulle underskirt? The underskirt is long under a circle skirt made of cotton bottomweight. It's a costume. Or do I just need to make the underskirt super thick? Looked for it for ages and finally found some - about to have my first attempt at fitting - wish me luck!